This month Ian Evans, Director at Thurrock Coalition, discusses how partnership working has helped to increase applications of lasting powers of attorney (LPAs). Thurrock Coalition is a user-led organisation that offers advice and support for disabled and elderly residents in Thurrock. The coalition, a network of individuals and groups, aims to inform people about their rights and entitlements as well as improve the quality and choice of services available to them. From research we discovered that there was a smaller uptake of lasting powers of attorney (LPAs) in Thurrock when compared to other boroughs, and a disproportionate concentration of LPAs within the most affluent residential areas. creating a network of local “champions” to increase awareness and understanding of the process and benefits of these instruments. To ensure the initiative was a success we identified a range of representatives from the local voluntary sector, including organisations that support under-represented groups. The identified individuals and organisations were then invited to training sessions which was facilitated by Thurrock Coalition and delivered by OPG. The network of LPA champions consisted of existing paid employees of organisations that are already providing free information and support to people in the area. They promote a basic understanding of LPAs, including the benefits, process, costs and common issues involved. 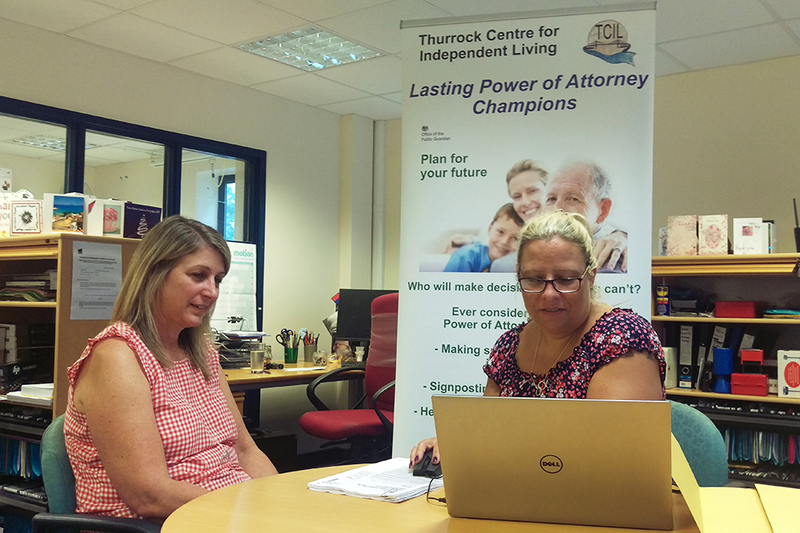 As a member of Thurrock Coalition, Thurrock Centre for Independent Living has taken lead responsibility in assisting people to complete LPAs and received referrals from the champions. The initiative was formally launched in January 2016, and since then we’ve showcased the benefits of completing LPAs through awareness events aimed at members of the public and professionals. It continues to go from strength to strength, and we’re seeing increasing referrals from a broad range of organisations and individuals including: Thurrock Hospital Memory Clinic, adult social care, the local Alzheimer’s group, the local carers support organisation – CARIADS, dementia support groups and Age Concern. We’re displaying and distributing leaflets, postcards, posters and flyers in the community, delivering talks and building awareness with clients and staff. Thurrock Centre for Independent Living has created a dedicated LPA information page. We have found that costs normally associated with instructing solicitors to complete LPAs is a potential barrier to some (upwards of £800 per application), especially for people with limited disposable income. The 158 LPA applications carried out to date have saved Thurrock residents an estimated total of £126,400. The initiative is proving to be a great example of partnership working, having a substantial positive impact on peoples’ awareness, understanding and preparedness for the future. For more information about the Thurrock LPA Champions Initiative, contact: ian@thurrockcoalition.co.uk or call 01375 389864. Hi,how do you cancel a existing lpa please? Hi, please call our contact centre on 0300 456 0300 who will be able to help.